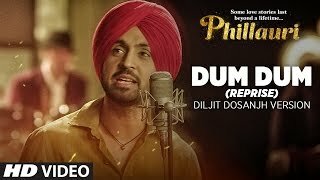 Presenting the video of Dum Dum (Reprise) Diljit Dosanjh Song from the upcoming Hindi movie PHILLAURI, directed by Anshai Lal. Produced by Fox Star Studios and Clean Slate Films, Phillauri stars Anushka Sharma, Diljit Dosanjh, Suraj Sharma, Mehreen Pirzada. The film is set to release worldwide on March 24.